The media embedding option in the clilstore tool allows you to insert audio material as well as video. This is often an attractive alternative. Sometimes teachers may want their students to concentrate on listening alone, without visual aids or distractions. Often it is easier and quicker to create audio materials – especially if you use a platform like Ipadio. TOOLS partner SMO intends to fully explore the audio option in its new community engagement project. This clilstore page was quickly created, using the online invitation issued to community members to take part in the new project. A couple of hours ago Tools project and its sites in social networks were presented to Marijampoles profesinio rengimo centras (Marijampole VET Centre) community. Language teachers of the Centre are future participants of the courses. 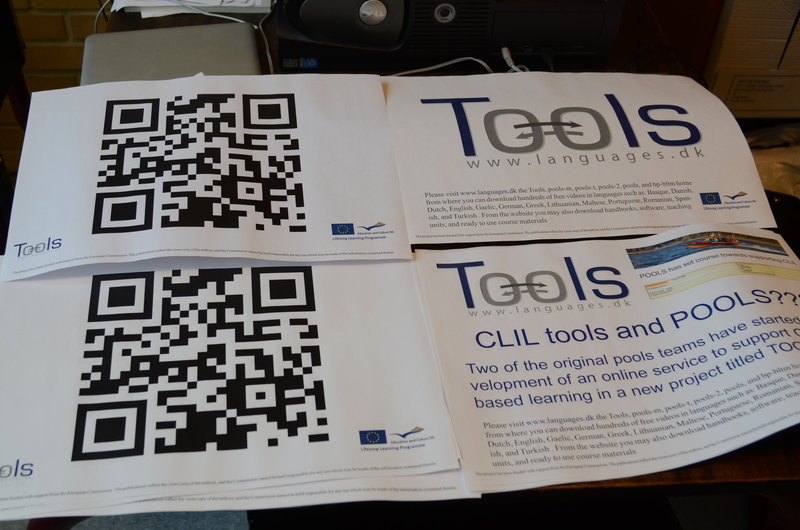 From now on they are invited to become members of tools4clil facebook and use/test the clilstore. For anyone who has a few of minutes to spare, I’d be glad if you could go to this address – http://www.smo.uhi.ac.uk/wordlink/?sl=gv&tl=en&url=http://gv.wikipedia.org/ (the Manx Gaelic Wikipedia viewed with Wordlink), and look up a few words first with the dictionary “Craine” and then with “CraineTEST”. Let me know if they both work ok and if you notice any significant difference in speed. I don’t see any great benefit of one method over the other at the moment, but it is useful to have them both in the “armoury” of methods available. The new method might be useful for dictionaries which can save user options, or where access is restricted to certain web addresses, or which require a login and save this in a cookie. This is the community context in which TOOLS partner Sabhal Mòr Ostaig will be working with local training and media groups, aiming to include clilstore where appropriate as an additional tool. The Island Voices project is moving into a new “grassroots” phase now. We aim to encourage community members to create their own pieces of work – whether in video, audio, or written texts. Help will be available, either with the language or the technology, to get you started, but it’s your stories, or conversations, or songs, or even movies that the rest of the community would like to hear or see. And with Am Pàipear on board we will have a local outlet for your work, ready and willing to reflect our community lifestyles. Here’s a Gaelic example. Just click on the graphic below to see what kind of thing we have in mind. Here is a nice fragment – to my mind one of the most beautiful historical texts about languages, written by Mikalojus Daukša in 1599. 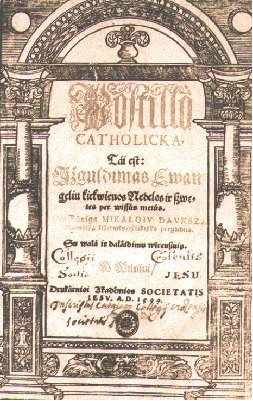 It was written as a foreword to Postylla Katolicka by Jokubas Vujekas, rector of the Vilnius Jesuit College, which Daukša translated from Latin into Lithuanian. In this foreword he gave his due to the Lithuanian language, and the Foreword itself can be regarded as an ode to any Mother tongue. For several decades this fragment is learnt by pupils at schools in Lithuania by heart. The “Foreword to the Gracious Reader”, which exalts the native tongue, emphasizing its importance to nation, and which expresses the hope that Lithuanian will become the language of Lithuanian literature and public usage is highly significant to the history of Lithuanian culture. It is neither the bounty of its crops, nor the distinctiveness of its garments, nor the beauty of its countryside, nor the strength of its castles and cities that make a nation hale; rather it is the maintenance and use of its native language, which strengthens fellowship, peace and brotherly love. For our language is our common bond of love, the mother of unity, the father of civic solidarity, the guardian of nationhood. Destroy a language and you will destroy consonance, unity and virtue of a nation. Destroy language and you will kill the sun in the sky, muddle up the order of the universe, and take away breath and honour. In connection to what I previously wrote – the Basque language. Language teachers from San Sebastian have always been in pools project, but the revival of the language has taken place much earlier. I just marvel at the energy of those people – they were heroes of their times – who managed to bring back the Basque language into the country’s lives and homes. They managed to preserve one of the world’s treasures. Same are our colleagues from Sabhal Mòr Ostaig and University of Ulster, I guess. Their energy and efforts of trying to revive the Gaelic – Scottish and Irish – language are worth highest admiration! I am sure they will succeed. P.S. amazing how each of us can use most modern tools to revive history and world heritage. You are currently browsing the tools4clil blog archives for February, 2012.